Lake Simcoe, a short drive north of Toronto, offers some of the best fishing in the province. The lake is fished year round, and is famous for it's winter lake trout and whitefish bonanza. Cook's Bay, the south part of Lake Simcoe, is shallow and weedy, whereas the main lake is deeper (max. depth 136 ft. - Kempenfelt Bay). The lake has endless fishing opportunities; the shallows are rich in weed growth, where bullrushes, eel grass, and cabbage weeds flourish. The main lake has many humps, points, and shoals; home of the legendary Lake Simcoe Smallmouths. PIKE In spring, pike are concentrated in Cook's Bay at the mouth of the Holland River. Cast spinner baits and shallow diving crankbaits (ie. walleye diver) in perch patterns, especially early in the morning. Fish water between 6-10 ft. In summer, pike stay in Cook's Bay, but move to deeper water. Fish just outside of Keswick, look for the drop-offs at the 10-18 ft. mark, offshore areas along weedlines can be productive. Troll or cast diving crank baits in perch or minnow imitations. If fishing is slow, use a bobber baited with a live sucker. 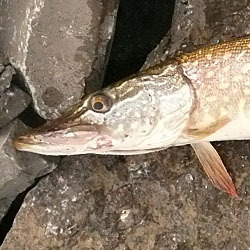 In Winter, pike can be caught using Tip ups, baited with a large sucker minnow. Ice fishing is quite popular on Lake Simcoe and Cook's Bay, although locating pike can sometimes be challenging. PERCH Lake Simcoe and Cook's Bay is famous for it's jumbo Perch. 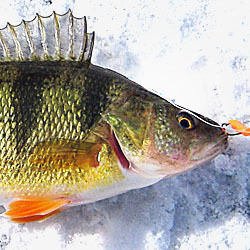 Anglers target the perch heavily during the icefishing season, which begins in mid-Janurary through until mid-march. Spring and Summer fishing for Jumbo perch is also excellent, especially during the morning hours. Bobber fishing with worms and live minnows is the method of choice. Spring hotspots include Atherley Narrows, Keswick, Jackson's Point, Roches Point and Lake Couchiching. LAKE TROUT Winter icefishing on Lake Simcoe is also the best time to target the Whitefish and Lake Trout, which are quite abundant due to the stocking efforts of the MNR. In winter whitefish can be found in depths of 50 feet and up, although the magic depth seems to be 80 feet. The best time to catch Lake Simcoe whitefish is in late January to mid-February, with most action generally between dawn and noon. Live minnows fished right on bottom with Lake Simcoe spreaders or perch rigs seem to produce well. Jigging spoons, like the williams half & half can also entice some whitefish, especially when the whitefish are schooling. Lake Simcoe lake trout can be found in the same areas as the whitefish, although they are often near deeper water between 90-100 feet. Early in the ice fishing season, jigging spoons a few feet off bottom can produce some aggressive strikes from active trout, once again the williams half & half seems to be the lure of choice, although rattle spoons and large meegs or bad boyz tipped with minnows can also be productive. Later in the season, large live minnows fished near the bottom can be deadly. Historically some the best areas to catch Lake Simcoe lakers are the shoals around Big Bay Point and Fox Island. Recent studies have shown some natural reproduction of the lake trout, which may be due to habitat restoration and abundance of forage. Lake Simcoe lake trout mainly feed on Lake Herring (Cisco) and smelt, and lures which mimic their natural prey are always a good choice. LARGEMOUTH BASS Largemouth Bass are abundant in Cook's Bay, due to it's shallow and weedy nature. The Holland River is legendary for it's monster bucket-mouths, 5 pounders, are not uncommon. The Largemouths in the Holland River, are concentrated in the bullrushes that line the river. They reside in the undercut banks created by the many passing boats, fish for them by pitching a jig 'n pig into the bank. Use dark colours blue, black, or brown and concentrate on areas of the river with deep water access. For the Holland River this is about 7 ft. Also fish the shoreline canals in and around Keswick, once again search for cover near deeper water. Main Lake Simcoe largemouth bass can be found around deep weedlines 15-20 feet, especially in mid-summer. Fishing jig 'n pigs or large plastic worms along these deep weedlines can produce some big bass. In Lake Simcoe, the main forage for largemouth bass is perch, and casting deep diving crankbaits in perch patterns can be deadly, especially at dawn and dusk. SMALLMOUTH BASS Smallmouth Bass are found scattered throughout main Lake Simcoe. The Simcoe smallies grow huge (6 pounders a possibility) due to the large amount of crayfish and perch in the lake. The Pro Bass Tournaments held on the lake annually always weight-in heavy stringers of smallies, and many a tournament has been won with a 5 bass limit of smallies. The smallmouths are concentrated in the area south of Orillia and Atherly Narrows-past Thorah, Strawberry and Georgina islands. The fish relate to the numerous limestone shoals, rock-and-sand transitions and major island points that abound in this region of the lake. Also the water is very clear, with visibility up to 15 ft. deep. Fish for smallies in all these areas with deep diving crankbaits (perch and minnow imitations). Also fish a jig, smoke colour works best, slowly along the bottom. Usually the smallies can be seen on the shoals, use light line, and finesse fishing to entice them into biting. CRAPPIE Crappie are very abundant in Lake Simcoe and is a highly prized catch. Most of the crappie fishing is concentrated in the Holland River and Southern Cook's Bay region. In early spring, beginning in late March throughout April, large numbers of crappie enter the Holland River to spawn. The Holland River crappie concentrate in large numbers in the warmer waters of the many canals and bays just after ice out. Fishing near sunken logs, brush piles and under bridges are key holding areas. The bait of choice is a small minnow suspended under a float, although tiny jigs in pink, white and chartreuse can also be productive. Each detailed map provides depth, contours, structure, boat ramps, and updated fishing information. 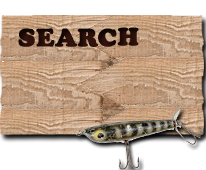 Lake Simcoe fishing maps also include lake info such as gamefish abundance, forage base, water clarity, weedline depth, bottom composition, complete latitude/longitude grid lines and dozens of GPS waypoints & coordinates. "Finally, a full-fluoroine formulated specifically for combat fishing! Sunline Crank FC Fluorocarbonine offers advanced performance for crankbaits, reactionures, and high-leverage hardbaits of all kinds. This unique 100% fluorocarbon fishing"
"The best crankbaits have an erratic, searching motion on a straight retrieve,ike the Megabass S-Crank Crankbait. Pros will tear through hundreds of new baits, hoping to find the one in a dozen or more with that magic hunting action"